The Professional Regulation Commission (PRC) recognized the top performing examinees (topnotchers) who garnered the highest grades in the March 2017 licensure exam for teachers (LET) - Seconday level. PRC on Monday, May 22, named Marian Kaye Fortinez Gallego from University of Mindanao (UM) - Davao City as the topnotcher for Secondary level exam with 92.80%. It was followed by Acejan Lascuna Jadie De La Salle University (DLSU) - Dasmarinas with 92.60%. Check out on this page for the full list of top 10 passers - rank, school and average rating. 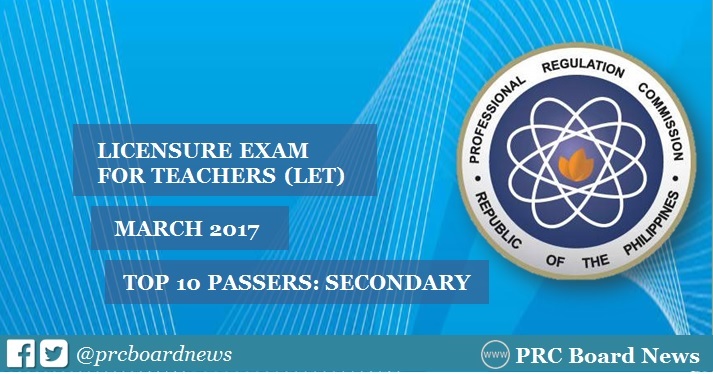 It can be noted that graduates from provincial schools dominated the first licensure exam for teachers last year. Michael Prince Notorio del Rosario from Lorma College topped the board with 92.00%. Here's the summary of topnotchers for LET in the previous years.